Denesh Ramdin, the West Indies wicketkeeper, has been named captain of the Test side and will take over from Darren Sammy, who will remain the T20 captain. This means West Indies have three separate captains for all three formats. 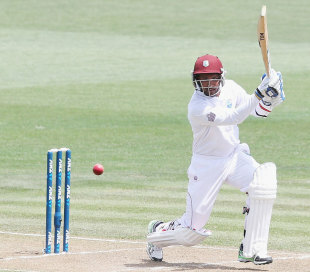 Ramdin's first assignment will be the home series against New Zealand which begins on June 8. He has led the national side in three T20s and an ODI. His experience with Trinidad & Tobago is more extensive with 37 matches at the helm across formats. He has 21 wins under his belt and took T&T to the semi-final of the Regional Four Day Competition this season. This is the second time in as many years that Sammy has had to relinquish captaincy. Last May he had to make way for Dwayne Bravo to become ODI captain after criticism regarding his batting too low and his ability as a strike bowler. Sammy's tenure as Test captain began in November 2010 when West Indies drew a three-match series against the hosts Sri Lanka. His best accomplishment as captain was when West Indies won six consecutive matches in 2012-13 which lifted the side to No. 5 in the rankings. But an overall record of 8 wins to 12 losses - including a spell of five defeats in their last six matches - has hurt his cause. Sammy's three-year stint was marred by debate over his reliability as a player. He usually occupies No.8 in the batting order and has hit his only Test century and all five fifties in that position. But an average of 22.43 cites his lack of consistency and his straightforward medium pace, that fetched him 29 wickets in 10 matches, prompted several critics to question his impact as an allrounder. Congrats to Ramdin on being name test Captain. God's speed brother as u look to take us forward. Thanks to all for the support.